This small SUV has been surprisingly popular since its model-year 2013 launch and is without question the most luxurious subcompact crossover for the money. With a 138-horsepower turbocharged 1.4-liter four-cylinder its sole engine, acceleration is just OK, but handling is very and the ride pleasingly smooth. 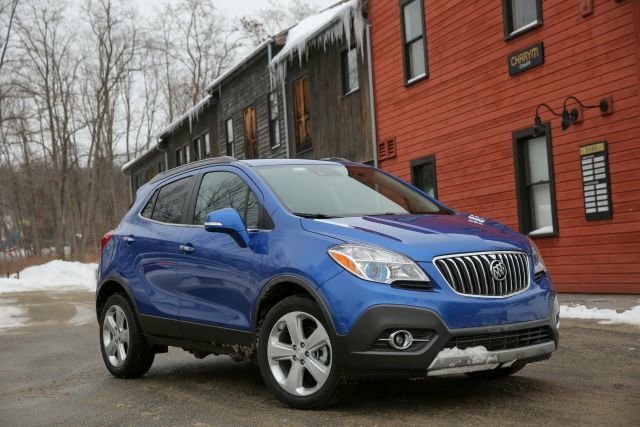 Encore stands out from the growing crowd of subcompact crossovers with an interior that’s well-finished and, thanks to the tall roofline and upright seating, unexpectedly roomy. It’s trimmed in top-quality materials and features an easy-to-operate touchscreen media control panel. What’s more, the passenger compartment is by far the quietest in this class – better even than some larger and far costlier SUVs – thanks to a sophisticated electronic noise cancellation system and assorted sound absorbing materials that minimize road and wind noise. Even the base Encore comes with a long list of features, and compared with class rivals on a feature-to-feature basis, any version is a solid value for the money. Best buy is the midgrade Convenience trim with all-wheel-drive. It comes nicely outfitted with a power driver’s seat, satellite radio, full Bluetooth mobile-phone integration, and a blind spot monitor with cross-traffic alert. New for 2016, the Sport Touring model adds a slightly quicker 153-hp turbo four-cylinder and specific trim items, but commands a $1,000 premium over the similarly equipped Convenience version for not much payback. Among Encore downsides, the styling is a little odd, and keyless entry with pushbutton start is unavailable.